If you look closely at this picture, you'll see that one handle-bar is broken off. Pretty hard to ride a bike in that condition. I've pinned many photos on Pinterest that involved old bicycles leaning up against buildings, fences, etc. I love the look it invokes of having just jumped off of your bicycle to run inside to have a cup of tea with a friend. So I was overjoyed when this bicycle got broken. Ha! 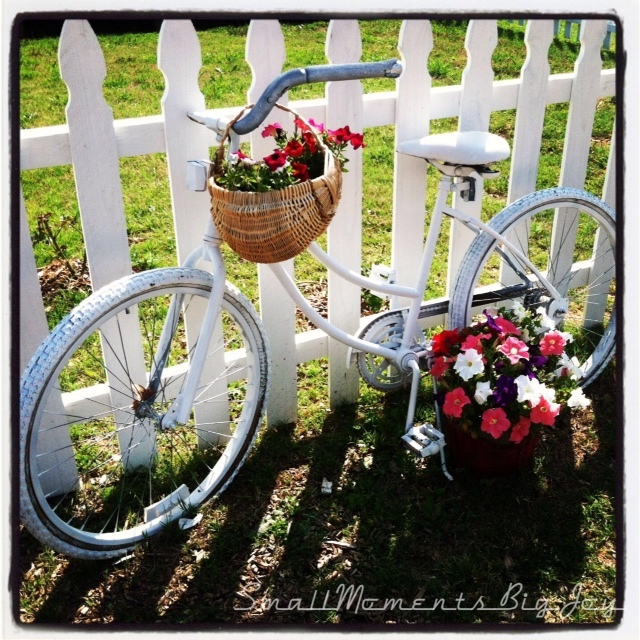 A couple of coats of white spray paint was all it took to transform it to garden-ready. I change the flowers with the seasons, and this is one of my VERY favorite outdoor decor items. It makes me smile every time I look at it. Do you have a broken bicycle in the back of your garage? Grab a can of spray paint and go to town!